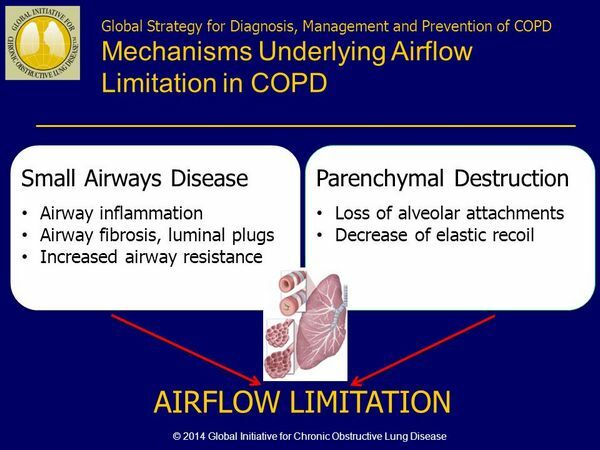 Chronic Underlying Airway Disease Acute exacerbations of chronic obstructive pulmonary disease is an umbrella term that includes the entities of chronic bronchitis and emphysema when they are associated with airflow limitation. Ordinarily, asthma, cystic fibrosis, bronchiectasis, and bronchiolitis obliterans (other bronchitic syndromes) are excluded from this definition. Most definitions consider acute exacerbations of chronic obstructive pulmonary disease to be a disease state characterized by airflow limitation that is not fully reversible. The airflow limitation is usually progressive and associated with an abnormal inflammatory response of the lungs to inhaled particles or gases. Individuals with chronic lung diseases such as chronic bronchitis, emphysema, and asthma develop structural damage to their lung architecture as a result of exposure to various environmental or genetic stimulants. These stimulants include cigarette smoke, pollutants, infectious pathogens, and allergens. When pulmonary tissue is exposed to these stimuli, the physiological response is inflammation. When the exposure becomes chronic, the inflammatory response becomes chronic. An abnormal inflammatory response may also predispose individuals to chronic airway disease because excessive secretions of the inflammatory cells can cause occlusion of airway passages and/or contraction of airway smooth muscle. The airways subsequently narrow and become obstructed, preventing normal airflow to the lungs (i.e., obstructive lung disease). This impaired airflow compromises the patient's breathing and other vital processes, reducing quality of life and increasing the risk of life-threatening complications such as pneumonia and myocardial infarctions. Chronic bronchitis, emphysema, and asthma differ in their pathophysiological mechanisms but result in the same outcome: impedance of airflow to the lungs and a predisposition to acute respiratory exacerbations and infection chronic bronchitis is a clinically defined disease characterized by inflammation of the lining of the bronchial tubes resulting in diminished airflow to and from the lungs and production of heavy mucus or phlegm. Emphysema is defined in terms of anatomic pathology and is characterized by destruction of the walls of the air sacs of the lung, resulting in diminished elasticity of the lungs and decreased respiratory function. It is caused primarily by external stimuli such as cigarette smoking. Emphysema and chronic bronchitis often occur concurrently in the same individuals. Asthma is an inflammatory disorder of the airways, influenced by environmental and genetic mechanisms. Asthma is characterized by periodic attacks of wheezing, shortness of breath, chest tightness, and coughing. When any of these three conditions results in irreversibly obstructed airways, they become classified under the umbrella term acute exacerbations of chronic obstructive pulmonary disease. As a result, the signs and symptoms of these diseases overlap considerably. In fact, many patients may suffer concomitantly from two or three of these syndromes. The schematic shown in FIGURE Overlap of obstructive pulmonary diseases illustrates the overlap in chronic bronchitis, emphysema, asthma, and acute exacerbations of chronic obstructive pulmonary disease. Clinically, the vast majority of patients diagnosed with chronic bronchitis and emphysema are classified as having acute exacerbations of chronic obstructive pulmonary disease. The frequency of acute exacerbations among patients is variable, similar to the varying rate of progression of chronic bronchitis, emphysema, and asthma among patients. It is important to note that these diseases can reach a "stable" state, with minimal or steady disease progression. However, acute exacerbations of chronic bronchitis occurs when this "steady state" is somehow disrupted by a trigger, such as an acute infection. For example, patients suffering from chronic bronchitis ultimately reach a steady state of the disease that is characterized by chronic sputum production, some degree of chronic dyspnea, and limitation of strenuous activity. However, stable patients exposed to a threshold level of stimulants such as cigarette smoke, pollutants, allergens, or infectious organisms can suffer from flare-ups or acute exacerbations whereby the excess inflammation and bronchial secretion results in symptoms of coughing and shortness of breath. FIGURE Overlap of obstructive pulmonary diseases. ← Pathogens Associated with acute exacerbations of chronic bronchitis.